Centuries ago, when Earth colonized the moon, no one could have predicted the Lunar population would evolve as it did. Now most of the Lunars possess the ability to control other people’s minds and to “glamour” themselves so they appear extraordinarily beautiful. But Luna’s Queen Levana is wholly evil, desirous to rule the Earth as well as the moon. Years ago, her scientists set loose a plague on Earth, and she will only provide the antidote after Emperor Kai of Earth agrees to marry her. The time for Levana to take over Earth has come. 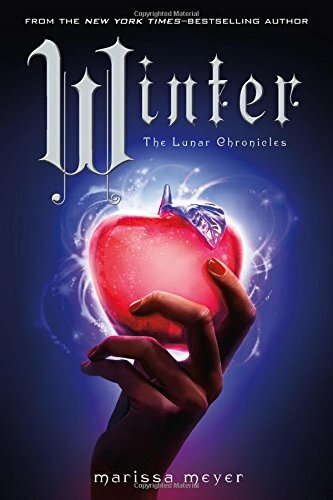 Winter is part four of the Lunar Chronicles, the much-anticipated conclusion to this addictive and highly engaging series. Like many series, readers are more likely to enjoy it if they’ve read the previous books. Even so, there’s much to relish in this book when read as a stand-alone. Marissa Meyer has created her own formula for a unique mix of dystopian sci-fi blended with fractured fairy tales, stirred vigorously with action, adventure, and love. Meyer has given life to perhaps the most intriguing group of characters in years. Cinder (based on Cinderella) is a cyborg mechanic who is at the heart of the series. She lives in New Beijing with her stepmother and stepsisters. Snarky androids replace singing mice. A broken bionic foot replaces the glass slipper. But Meyer takes this story much further as we learn Cinder has secrets in her past that she doesn’t yet know—secrets that could save Earth and all its citizens. Scarlet (based on Little Red Riding Hood) has unknowingly lived in great danger all her life. When her beloved grandmother disappears from their French farm, Scarlet’s life intertwines with Cinder’s. Scarlet meets—and falls for Wolf—a genetically-engineered (with wolf DNA) fighter for the Lunar Queen. The plot thickens and the mystery deepens as the pair joins forces with Cinder to protect Earth and prevent Emperor Kai’s marriage to the malevolent Levana. Cress (based on Rapunzel) lived locked away in a floating satellite (with no possibility of a haircut), spying on Earth for Queen Levana for much of her life. Cress is a techno wizard, skills that served the queen well as she first monitored Earth communications, then searched for Cinder, once captured, and now escaped. Cress places her allegiance with Cinder when she learns Cinder is actually the legitimate heir to the Lunar throne. The wicked queen has set her crosshairs on Cinder and has marked her for death at any cost. Enter Winter (based on Snow White), who even with a face marked by self-inflicted scars while under her stepmother Levana’s mind manipulation, is far more beautiful than Levana. What’s more, the people of Luna love Winter. Meyer’s extraordinary skill at extending familiar fairytale story lines to new characters while fleshing out well-known characters makes the entire series sparkle with excitement and innovation. The war between Earth and Queen Levana intensifies, with allies Cinder (aka Lunar Princess Selene), Cress, Scarlet, Winter, and Kai on one side, and Queen Levana’s powerful mind-manipulating thaumaturges backed by superior munitions and wolf warriors on the other side. As in all good suspense stories, things go from bad to worse to seemingly hopeless, with the heroes captured and escaping time and again. The dreaded wedding between Emperor Kai and Queen Levana which will make her Empress of pretty much everything is only hours away. Winter remains free, but she’s half-crazy from refusing to use her power to manipulate people’s minds. Perhaps the queen’s guard Jacin, in love with Winter since childhood, can help. After all, he’s been hiding Cress, and he saved Scarlet’s life as well. Will the revolution to oust Levana succeed? Can Princess Selene, her allies, and the abused Lunar citizens defeat Levana’s wolf soldiers and powerful thaumaturges, gifted with exceptional mind-controlling abilities? The tide of battle ebbs and flows. Injuries and deaths amass. The queen seems undefeatable, but Princess Selene will not give up for the very future of Earth and Luna is at stake. Readers may well predict the end of this somewhat overlong book (827 pages), but no one can guess the surprises revealed in the final pages. Winter is a worthy and satisfying conclusion to a unique quadrilogy of books.